Tired of the “evil twin” cliché found in such TV shows as Adventures of Superman, The Six Million Dollar Man, and Knightrider? That’s okay, we all are. However, replacing it is the polar opposite, and it makes it Bat-debut in this month’s issue of Detective Comics. Where once we had the Dark Knight fighting crime by the light of the moon, he is now pitted against the Arkham Knight, a villainous being intent on pushing back all evil under the sun. And when I say “knight,” I mean an actual knight in metallic armor, and squires to battle alongside him. The attack Batman as he is attempting to resolve a mystery of dead bats throughout Gotham City. Colonies by the dozen are simultaneously expiring, leaving thousands of dead bats in their wake. Is it a warning of some sort? And where do the Langstroms fit in? Brad Walker and Andrew Hennessy’s artwork is a welcome change from that of Doug Mahnke. Not that I objected to Mahnke’s work, but there is a noticeable difference that I expect will help keep the stories fresh. 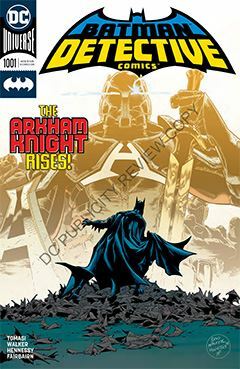 Despite last month’s landmark Detective Comics #1,000, it’s business as usual for the Dark Knight – as it should be. The fact that Detective has reached one of the highest numbers in comic book history does not elevate the stakes any higher than for any other title. It’s objective – and the objective of any title – should be to tell entertaining stories that engage the reader. Time will tell hop subsequent issues of Detective Comics accomplishes that.